Varicella Zoster Virus (VZV) is the virus responsible for the highly contagious disease commonly known as chickenpox. It is usually a disease seen in young children, from the ages of 4 to 12 years of age. * A person is contagious from one to five days before the rash appears and continues to be contagious until all the blisters have scabbed over. This means that a person can contract chickenpox from someone who hasn't even showed signs of the disease yet, making avoidance nearly impossible. * The incubation period is 10-21 days from the time of contact with a contagious person. * Chickenpox is easily transmitted by coughing, sneezing or direct contact with open sores of an infected person. It starts with a red skin rash which then develops into tiny liquid filled blisters that itch intensely. The blisters form mainly on the trunk and head, sometimes spreading to other parts of the body including the mucus membranes, such as the mouth, throat or nose. Within about two to three days, the blisters then begin to break open and become small open sores. They then begin to scab over. It takes approximately seven to ten days for the scabs to fall off after the onset of the initial rash. They heal for the most part without much scarring. * Chickenpox usually goes away without any type of medical intervention. * After a person develops chickenpox there is generally lifelong immunity from further episodes of chickenpox, even if the person is exposed again to an infected person. 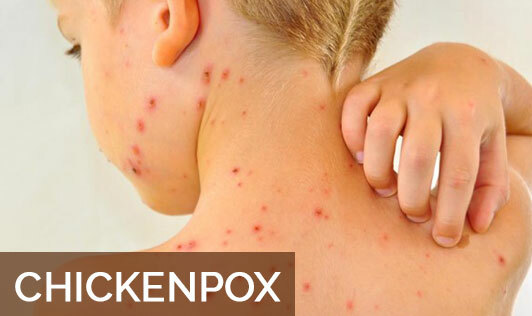 * Chickenpox is usually more severe in adults than in healthy children and they run an increased risk for complications. Those people with suppressed immune systems and pregnant women are at the highest risk for complications. * Pregnant women who were not previously immune to the disease and develop it during pregnancy can pass the infection via the placenta to the fetus. Depending on when the infection occurs, this can lead to a host of fetal malformations including underdeveloped fingers and toes, brain damage, neurological disorders and skin problems. It is essential that pregnant women avoid anyone who has been exposed to chickenpox or has shown signs of developing the disease. * A reactivation of the Varicella Zoster Virus can occur after the initial infection with chickenpox. When this occurs it is called shingles. This reactivation can occur decades after the initial infection. * Avoid contact with people who have been known to have been exposed to people with chickenpox. * Avoid contact with people who have chickenpox, if possible. * Avoid direct contact with open sores. * Avoid contact with any secretions from a person infected with chickenpox. * Avoid scratching the blisters as this will cause contagious fluid to leak and possibly cause bacterial infection of the sores. * The cause of chickenpox is from the exposure and contraction of the Varicella Zoster Virus in a previously uninfected or a person who hasn't been immunized. * Exposure to a person who's been exposed to an infected person or one who is contagious with the Varicella Zoster Virus is when it's in its active phase. * Anyone who has not received the vaccination against chickenpox is at an increased risk of contracting the illness. * People who have compromised immune systems, adults who have never had chickenpox and pregnant women are all at increased risk for developing complications. * Anyone taking any type of steroid medication for another condition such as asthma are at higher risk because of lowered immune systems.